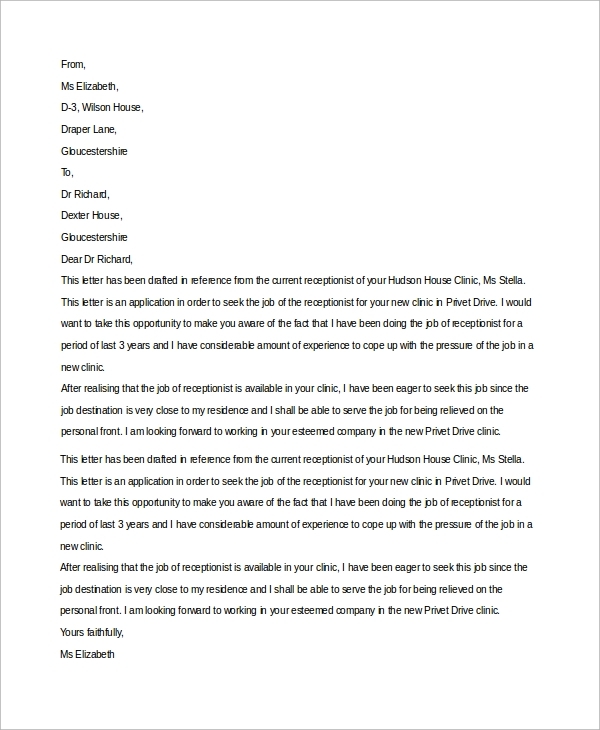 A cover letter is an application which covers your resume/CV that is attached with the resume/CV. The employer first reads the cover letter and decides to go for the resume/CV. The cover letter formats differ with different professions. 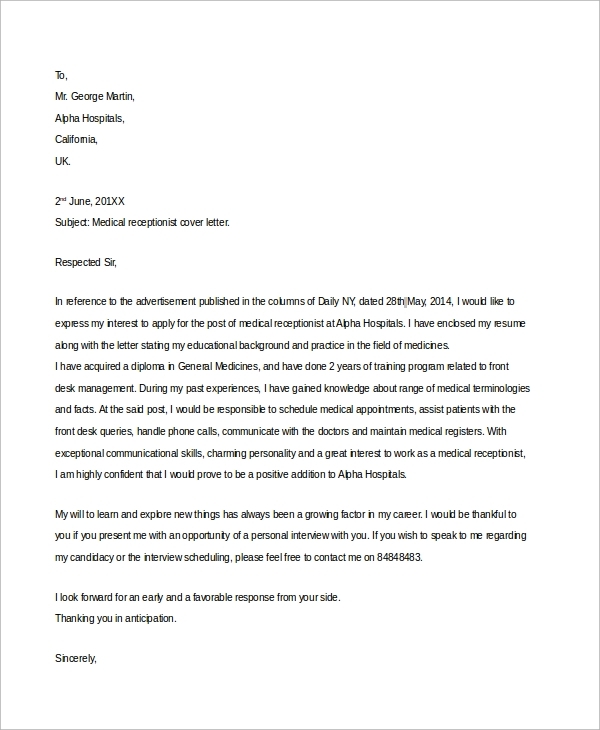 Receptionist cover letter is written specifically for applying as a receptionist for any company or institute. Listed below are some Sample Cover Letters that will guide you through the format and content of these letters. This Cover Letter Sample concerns itself specifically with the medical field. You can mention the details about your awareness about the medical profession and educational qualifications. Make sure you write in all the duties you will impart as a medical receptionist to give an impression of your awareness. In this Receptionist Resume Cover Letter for the front desk employee, enlist your abilities as a communicator, a telephone user, and a query solver. You have to mention your experience as a front desk receptionist since the job involves a lot of communication with the customers. 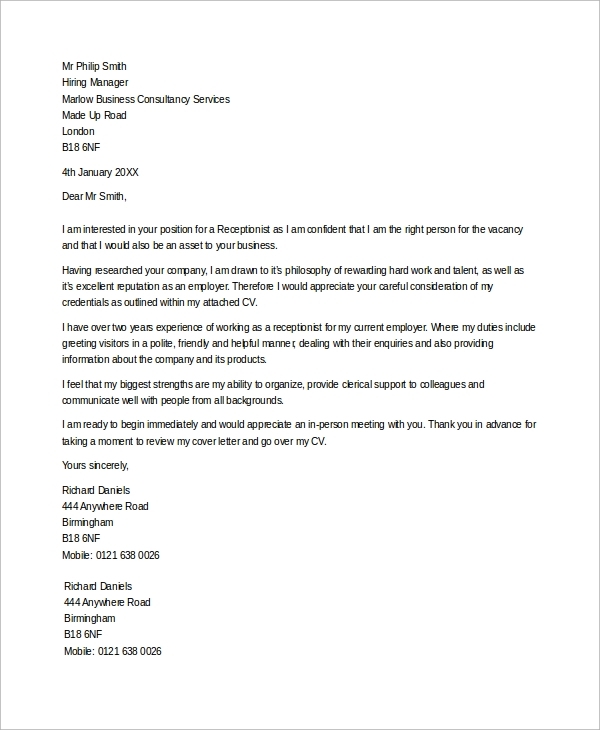 The Receptionist Cover Letter Example for an office front desk calls for the experience of working in a previous office. Write about your work history about the office size you handled, the number of co-workers you had at the front desk, and your skills for the same. Who is the Target audience for the Receptionist Cover Letter Samples? There are different audience targeted by various cover letters. However, the profession remains the same, that is the post of a receptionist. 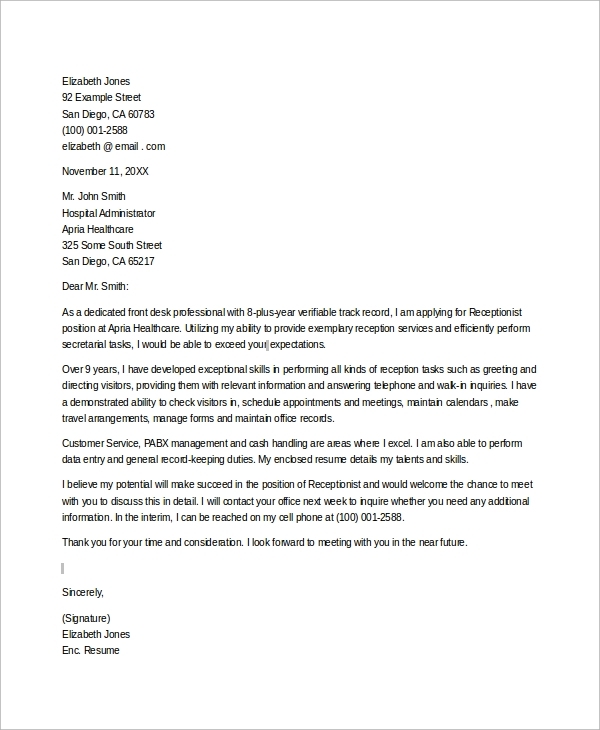 The medical receptionist cover letter is targeted for a clinic or hospital. Similarly, the office receptionist cover letter deals with a company or institutes like school and university consisting of an office for the front desk. Some people also get a full – fledged training for becoming a receptionist and the trained receptionist cover letter is written especially for this audience. 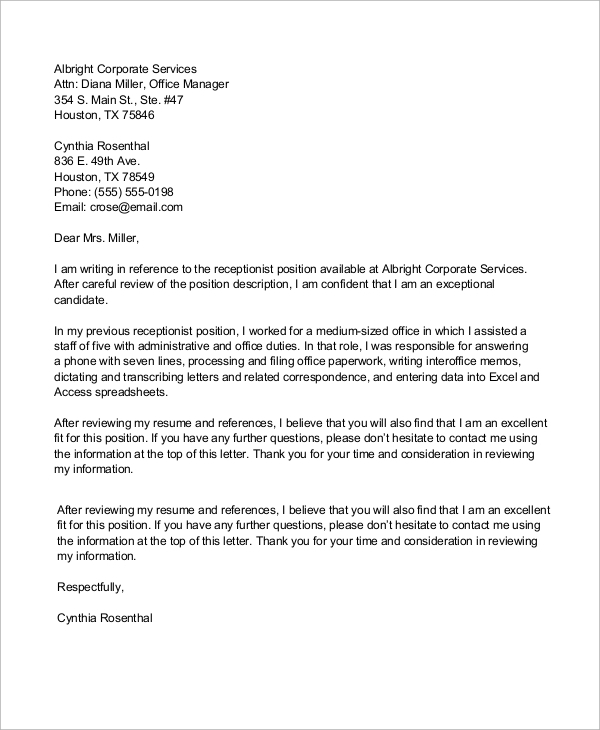 The cover letters for receptionist are written in the same format as any other cover letter, but the content varies highly. 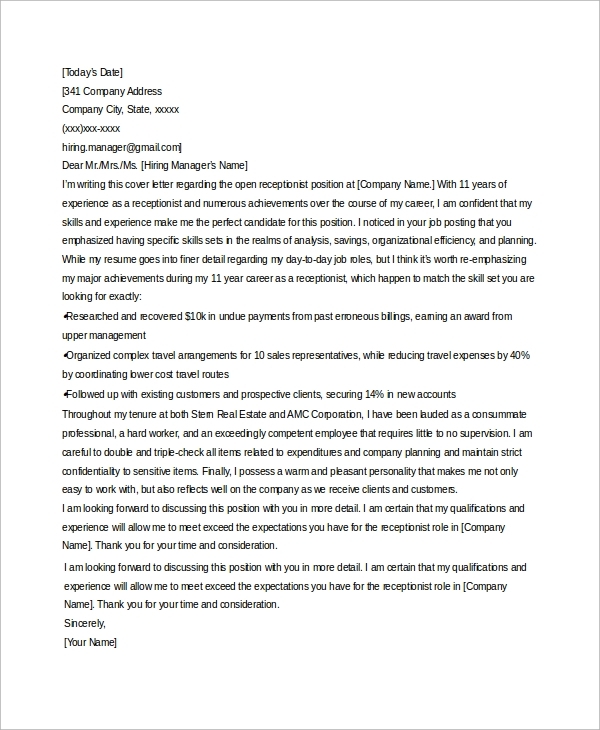 You can also see the Sample Email Cover Letters. These receptionist cover letters are written specifically by the people with a high level of training achieved in the field. You should describe your experience as a query attendee, a coordinator for meetings and events, and an overall communicator as a trained receptionist. This cover letter is written in reply to a reference for the job. 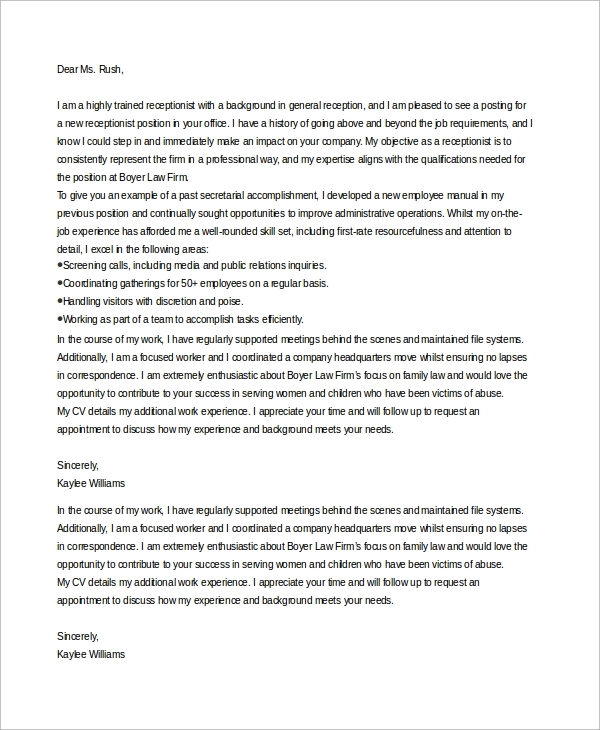 This receptionist cover letter includes the details about your previous career history as a receptionist and the skills you have acquired from the same. The uses and benefits for receptionist cover letter are many. They are used for supplementing the resume/CV with a brief written description of the applicant’s work history in the field, educational qualifications, and skills such as communication, coordination, managing, etc. for the post of front desk receptionist. It helps the employer to sort out all the applications by the receptionist cover letter. It benefits the applicant to create a record of all the qualities and qualifications in a written document. These cover letters offer a written description of the abilities and experience required to suffice or impress the employer. You can also see the Sample Job Cover Letters. Receptionist cover letters are written specifically for the job of a front desk officer. They convey the training and experience you have acquired as a receptionist. You can also refer to Cover Letter for Resumes on the internet for more guidelines. It will help you to build a stronger content for enhancing your chances of getting the job.